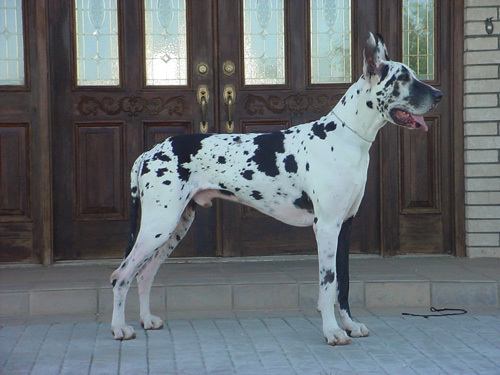 Harlequin is a coat pattern recognized only in the Great Dane breed. Harlequin is a modifier of merle. All harlequin dogs have one or two copies of the mutation responsible for merle. Non-merle dogs can carry harlequin, but will not appear harlequin. We have identified the genetic basis for harlequin in the Great Dane (Clark et al. 2011). Genetic testing is available. Genetic testing is available at UC Davis Veterinary Genetics Laboratory and Paw Print Genetics. By convention, because they are dominant mutations, merle and harlequin are denoted by capital letters (M and H). Lower case letters denote the wild-type allele. A "classic" harlequin's genotype is Mm Hh. 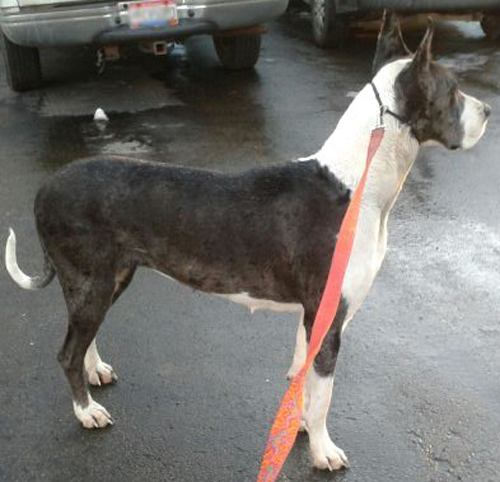 A mantle Great Dane may or may not carry harlequin. A mantle that carries harlequin can be bred to a merle and produce "classic" harlequin progeny. 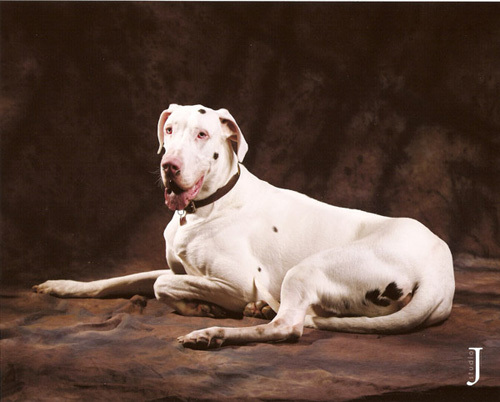 "White" Great Danes are typically double merles (MM) and also harlequin (Hh). A white dog will produce only merle and harlequin progeny when bred to a mantle. 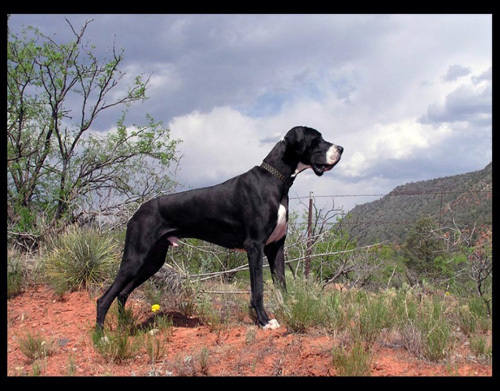 Merlequin (or Merlekin) Great Danes are double merles (MM) that do not carry harlequin (hh). A merlequin can produce harlequin progeny if bred to a mantle that carries harlequin. 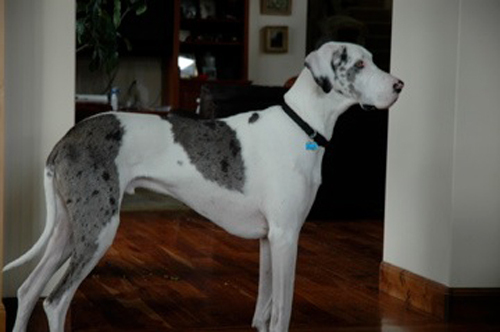 Mantle merle Great Danes have one copy of merle (Mm) and do not carry harlequin (hh). A mantle merle can produce harlequin progeny if bred to a mantle that carries harlequin. All harlequins are Hh. HH is not viable.